Heat is the number one weather related killer in the United States. Whether in the workplace, on the athletic field, or simply day-to-day, Heat Aware has your solutions to prevent deadly heat illness. Heat is the number one weather related killer in the United States. Statistical data from the National Weather Service shows that heat causes more fatalities per year than floods, lightning, tornadoes and hurricanes combined. From refinery workers to athletes to pastry bakers, Americans work and play in a variety of hot and humid environments. The Heat Aware™ card was developed to be used as a visual tool to raise awareness for those working or playing in extreme heat conditions! Heat Aware™ Cards: The Heat Aware™ card was developed to be used as a visual tool to help raise awareness for those working in high heat conditions. 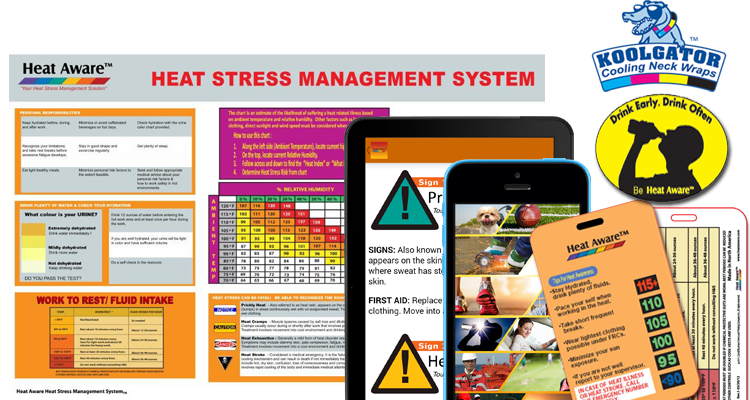 Heat Stress Management System Signs and Posters: The Heat Stress Management System Signs present vital graphic cues to raise awareness of and prevent heat related illness. They are available in three sizes and various materials appropriate for any high -visibility cool-down areas around your facility, inside or out. Koolgators: the Koolgator is a customizable cooling neck wrap. The snap is easy to attach and allows for a clean break away if necessary. The Koolgator is available as a stock item from Heat Aware™ subject to availability. May be customized with your company logo in full color. Hard Hat Stickers: Help spread the message for Heat Stress Awareness with our eye catching hard hat stickers. Printed with UV inks on weather proof vinyl. The Heat Aware™ App: A mobile reference tool to share with employees and help prevent heat stress and heat related illness. The Custom Heat Aware™ App: Can be tailored to the regulations, standards and culture of an individual company while consistently providing a pocket reference of the Heat Aware™ educational curriculum. Give us a call today at 713-228-9331 to discuss a customized Heat Stress Management package for your company.